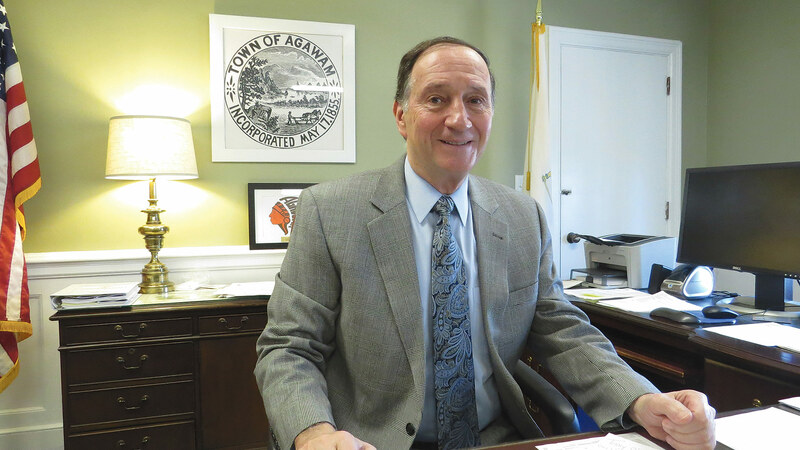 Mayor William Sapelli says Agawam is making progress on many economic-development fronts, from filling vacant storefronts to zoning reform to workforce-development initiatives in its schools. Mayor William Sapelli has developed a routine since he was sworn into office roughly 13 months ago. Always early to the ‘office’ (he worked within the city’s school system for decades and wrapped up his career as superintendent), he arrives at City Hall at 7:30 a.m., giving him a solid hour of relative solitude to write some e-mails and clear some paperwork from his desk before other employees start to file in. But his work day, if you will, actually starts at 7, when he stops in for breakfast at one of several eateries in town he frequents in something approaching a rotation. “Mondays I’m usually at McDonald’s, mid-week it’s at Partners, and Fridays I’m at Giovanni’s,” he said, referring, with those latter references, to the restaurant on Springfield Street, known for its breakfast items and as a place where people come together, and the Italian pastry shop on Main Street that is also a gathering spot. “There’s a crew of people that goes in there, and I think now they expect me because I’ve been doing it since I was first elected,” he said of Giovanni’s. “There are crews in each place, actually, especially McDonald’s; a number of seniors go in there. There’s 10 or 12 people, and we kibitz — it’s fun. “I get beat up sometimes, but in a fun way — they give me good feedback; it goes back and forth. They bust me about taxes or roads or whatever,” he went on, adding that, with municipal elections coming up later this year, there is a new topic of discussion, although he hasn’t formally announced he will run again. Overall, there is lots to talk about these days over eggs or French toast, especially the Morgan-Sullivan Bridge. Built in 1947, the span over the Westfield River links the city with West Springfield. It is a vital piece of infrastructure, major traffic artery, and entranceway to the Eastern States Exposition, and now it’s about five months into what will be a roughly three-year facelift and widening initiative that is projected to solve persistent bottlenecks in an important commercial area. But this undoubtedly will be a long three years, the mayor acknowledged, adding that two lanes of the four-lane bridge are now closed, and it will be like this way probably until the calendar turns to 2022. “It will be an inconvenience, but this work has to be done; it is what it is,” he said, putting Bill Belichick’s classic phrase to work while noting that the inconvenience extends beyond motorists and their daily commutes. Indeed, it will also impact businesses in the area just over the bridge, many of which are relative newcomers to Agawam (more on this later). Beyond the bridge, other topics of conversation at breakfast include everything from storm drains — Agawam, like all other communities, is facing stiff mandates to update their systems — to streets and sidewalks, to schools and taxes. The mayor recently took the conversation from the lunch counter to City Council chambers for his State of the City address, the first for this community since 2012. Recapping for BusinessWest, Sapelli said he told his constituents that there are challenges ahead, especially with the bridge, but also opportunities, especially within the broad realm of business and economic development. Indeed, using two acronyms now probably quite familiar to those he’s sharing breakfast with — DIF (district improvement financing) and TIF (tax increment financing) — he said officials have been bringing new businesses to the city and allowing existing ones to stay and grow. The DIF has been used to help bring new stores and more vibrancy to the Walnut Street retail area of the city, while the TIF, which is awarded to new or existing businesses willing to commit to adding additional jobs, has been used to enable Able Tool, formerly in the Agawam Industrial Park to build a new building on Silver Street and essentially double in size. But economic development comes in many forms, he said, touting initiatives in the city’s schools aimed at both introducing students to careers and helping ease some of the region’s workforce challenges. These include the creation of an advanced-manufacturing program at Agawam High School and a heightened focus on making students aware of career options that might not involve a college education. For this, the latest installment of its Community Spotlight series, BusinessWest caught up with the mayor after his breakfast ritual — and after answering all his e-mails — to get a progress report on one of the region’s smaller but more intriguing cities. While the start of work on the Morgan-Sullivan Bridge has triggered a host of questions for those breakfast sessions over the past 13 months, it has actually removed one topic from conversation — at least temporarily. Indeed, the former Games & Lanes property on Walnut Street Extension, long an eyesore and source of unending questions and speculation about potential future uses, before and after it was torn down, has become a staging area for the contractor hired for the bridge project, Palmer-based Northern Construction. But there are still plenty of other things to talk about, said the mayor, who was just settling into his new job when he last talked with BusinessWest. Not quite a year later, he feels more comfortable in the role and is already talking about the challenges of having to manage a city and run for office every other year (Agawam is one of the few cities in the region that have not moved to four-year terms for their mayors). Lately, he’s been learning quite a bit about bridge reconstruction and all the issues involved with it. The same goes for his counterpart in West Springfield, Will Reichelt. The two meet and converse often on the matter on the matter of the Morgan-Sullivan Bridge in an effort to stay ahead of it and attempt to minimize the potential disruption. As an example, he pointed to the jersey barriers now up on the bridge. They went up just a few weeks ago, but the initial plan was to erect them months ago, when it wasn’t actually necessary to do so. While day-to-day traffic will obviously be impacted by the bridge work, attention naturally shifts to those 17 days in September and October that comprise the Big E’s annual run. The two mayors are already in conversations with leadership at the Big E on ways to mitigate the traffic problems, said Sapelli, adding that shuttle buses are one option, and, in the meantime, electronic signs will likely be put out on I-91 and perhaps other highways to encourage Big E visitors to take alternative routes. As noted earlier, the phrase ‘economic development’ takes many forms, and in Agawam that means everything from zoning reforms to work on roads, sidewalks, and storm drains; from to efforts to raze blighted properties and commence redevelopment to ongoing work to bring new businesses to the city. And Sapelli said there’s been recorded progress in all these realms and many others. More than $2 million has been spent on streets and sidewalks — on both preventive maintenance and replacement — and another $900,000 was recently transferred from free cash to continue those efforts this spring, he noted, adding that 11 blighted properties — 10 homes and one business — have been razed, and another three homes are prepped for demolition, with 10 under renovation and more in the queue for receivership. “This is a very involved process, and it’s takes time to take these properties down,” said Sapelli, adding that these investments in time and energy are well worth it to the neighborhoods involved. As for new businesses, the mayor listed several, including Taplin Yard Pump & Power, now occupying the former Allen Lawnmower property, JJ’s Ice Cream, and several other small businesses. He noted that considerable progress has been made with filling vacancies in the many strip malls and shopping plazas that populate the city. As examples, he cited what’s considered Agawam Center, a lengthy stretch of Main Street, where several vacancies have been filled, and also the old Food Mart Plaza on Springfield Street, which is now essentially full. District improvement financing has been key to these efforts, he said, adding that, with this program, taxes generated in a specific area — like Walnut Street and Walnut Street Extension) — from new businesses and higher valuations of existing businesses are put into a designated fund and used to initiate further improvements in that zone. Many of these new businesses will no doubt be challenged in some ways by the bridge project, which will dissuade some from traveling into that retail area, said Sapelli, before again stressing that he and his administration, working with West Springfield leaders, will endeavor to minimize the impact. Meanwhile, another avenue of economic development is education and workforce development, said Sapelli, noting that the School Department has been focusing a great deal of energy on non-college-bound students and careers in manufacturing and other trades. “Superintendent [Steve] Lemanski and his staff are addressing the needs of those who will go on to careers, instead of going on the college,” he said, adding that the School Department is working in conjunction with the West of the River Chamber of Commerce on initiatives to introduce students to career options. As this spotlight piece makes clear, there is certainly plenty for those Sapelli is sharing breakfast with to kibitz about these days. Between taxes, bridges, roads, sidewalks, and new businesses, there is plenty of material to chew on (pun intended). Overall, there is considerable progress being made — and that includes Morgan-Sullivan Bridge itself — to make the city an attractive landing spot for businesses and a better place to live and work.